Ladder Safety will show on screen for download and we will email you a copy. 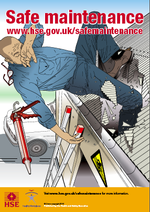 This poster is for the Health and Safety Executive's Safe Maintenance Campaign. in partnership with the European Agency for Safety and Health at Work (EU-OSHA), the EEF and the TUC. This Europe wide campaign promotes a safe and healthy workplace - through encouraging an in depth and structured approach to maintenance. Maintenance affects each area of health and safety. A large number of accidents and diseases are caused by poor standards and a failure to keep the work environment in a good condition.